A complete swimming pool maintenance company, Pool Medic has been servicing, repairing, and renovating swimming pools in the south Grand Strand area since 2005. Homeowners and businesses throughout Myrtle Beach, Surfside Beach, Garden City, Socastee and Pawleys Island, South Carolina have relied on Pool Medic's knowledge and experience. We have expertly trained technicians on staff and guarantee our work will be done right the first time, at an affordable price. 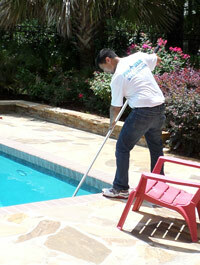 Pool Medic offers year round, weekly upkeep programs to keep your pool clean, clear, and balanced. Services performed by our experienced technicians include chemical balancing, water testing, skimming, vacuuming, and much more. Whether it's mechanical, electrical, or a plumbing issue, we can fix it all! 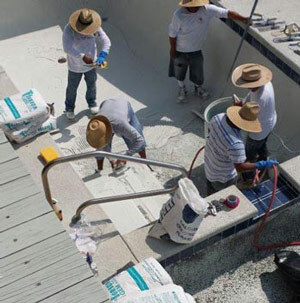 Pool Medic provides premium pool repair services for in-ground pools in Myrtle Beach, SC and surrounding areas. With our premier pool design and construction services, Pool Medic can design and build a pool that will turn your existing yard into a delightful backyard oasis. Since 2005, Pool Medic's staff of experienced and knowledgeable technicians have successfully helped homeowners throughout the Myrtle Beach, SC area with all their pool maintenance, repairs, and remodeling needs. Read what people are saying about Pool Medic and be sure to check out our work in the photo gallery! Pool Medic has cleaned and serviced our pool for several years. They always do an exceptional job, are timely, and conduct themselves in a professional manner compared to other companies we've tried in the past. I am a member of the HOA and a resident of the International Club (Pebble Creek) in Murrells Inlet. Ever since your company, Pool-Medic, became responsible for the maintenance of our amenity center pool, a transformation took place. The pool water, condition of the surrounding deck and furniture, and the restroom facilities are kept in stellar condition. If problems or questions arise, they are addressed with expedience. Thank you and your pool service mechanic for a job well done! We have used Pool Medic for over five years now and have had a great experience. They have replaced portions of our pool deck, serviced our pump, and maintained the pool for us year round. They are very knowledgeable, professional, and always courteous and ready to help. If they see anything unusual around the house, we can count on a phone call. Our pool always looks great! We would not use anyone else!! We have owned our Surfside Beach house for three and a half years now and have had three other pool companies service our pool. They all fell short. We constantly had renters complain about the condition and when we used the house for ourselves in the off-season it was always dirty. We are so glad we found Pool Medic. We have not had any complaints since our switch and we came down last week to a crystal clear pool. Thanks again and keep up the good work! We have received 5-star service from Pool Medic beginning with our first appointment.They are personable, knowledgeable and pays attention to detail, taking great pride in his work. After the resurfacing of our pool and deck and replacement of some tiles, the pool looked great. A season later there was some settling and Pool Medic immediately came to make the minor repairs at no charge. They have subsequently put in a heater for our pool and we are delighted with that as well. Pool Medic also holds a 5 star rating and receives numerous referrals from Angie's List. Feel free to rate us on any of the review sites below as well as any other sites not listed here.